Apple’s goal with iWeb is to give home and non-professional users an easy way to create and update lively, personal Web sites without needing to know the harsh mechanics of complex Web building technologies. With the addition of FTP capabilities and some powerful new widgets, iWeb ’09 accomplishes that mission with flying colors. Despite its powerful features, it’s amazing how simple it is to use. In this version of iWeb, the methodology of designing a gorgeous site remains unchanged. All design work takes place within one window, accompanied by four palettes: Inspector, Fonts, Colors, and Adjust. The Media Browser, where you find your images, music, and videos, now abuts the main window as a newly styled drawer, and a Show/Hide Media button appears in the toolbar. Also new to the toolbar are the Add Page (replacing the mysterious plus sign), Publish Site, and Visit buttons. Gone are the Web Widgets and the Forward and Backward buttons. The File -> New Site command launches the template chooser where you can choose from 27 themes (two are new, one is still blank). Select your first page from that theme’s set: Blank, Welcome, About Me, Blog, Podcast, Photos, My Albums (photo gallery), or Movie. The site and pages you add appear in the sidebar. Clicking on any page shows it in the Webpage canvas where you can then tweak and add content to it. As always, you can add media to your pages from the Media Browser, drag in any image from the Finder, or drag a folder or image into the Media Browser. The Media Browser’s functions have not changed, though I hoped to see iPhoto ( ) ratings and larger image previews in this version. iWeb’s new widgets present additional exciting options for your site. In the Media Browser’s new Widgets tab you’ll find nine widgets. New are YouTube, iSight Photo, iSight Movie, Countdown, and RSS Feed. The others, MobileMe Gallery, Google Maps, Google AdSense, and HTML Snippet, have been moved from the toolbar. Embedding a YouTube video on a site typically requires entering HTML into the page code and uploading it to see the result. With iWeb, after copying the video URL from the YouTube site, you just drag the YouTube widget onto your page template and paste that URL into the settings. The video plays right in iWeb if you’re online. You can resize it, move it, or jazz it up with a frame or a border. iWeb ’09’s familiar interface includes some new buttons and a Media Browser drawer you can toggle. Here, we adjust the angle of an image in an iWeb page. Adding the new iSight video or photos, live date countdowns, and Really Simple Syndication (RSS) feeds is similarly easy. Drag one of the iSight widgets onto your page and click the camera icon. Then resize and reposition the image. You can rotate photos (press Command as you drag a handle) or place a border. Countdown adds a live date countdown, optionally showing years, days, months, minutes, and seconds. Dragged to your page, the settings appear for you to choose. Selecting the counter text lets you change the font and color just like you can with any text. The RSS widget is powerful. With it, any RSS feed on the Web can be displayed on your page. For example, if you have a set of images on Flickr, get the RSS address, place the widget on your page, enter that address, and your page displays those photos. Use it to place updating news or other information on your page. Although not new in this version, the HTML Snippet widget is noteworthy because you can use it to place other widgets on your site. It’s disappointing that iWeb still does not have an e-mail-masking widget that shields your address from spammers. It’s easy to use widgets on your pages. Here we customize the Countdown widget. Perhaps the most significant upgrades to iWeb are its new uploading features: built-in FTP and individual site uploading. 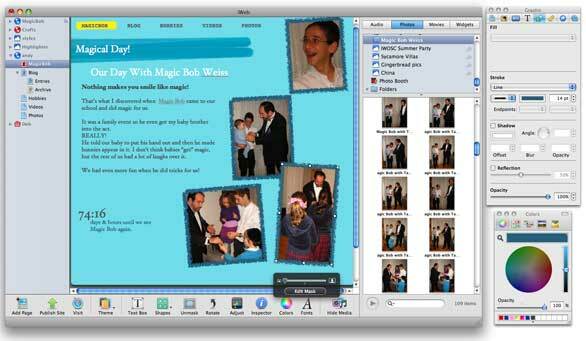 Until iWeb ’09, you could directly upload sites only to MobileMe. To get a site to your own server you had to publish the site to a folder, and then use a third-party FTP program to actually upload it. Now you can publish each site wherever you want, and that is great news. If you have a MobileMe account you can upload one or more sites there. If you own a domain and have hosting service, you can send any iWeb site directly to that server, and you can still export a site to a folder if you choose, to upload it using a third-party FTP app. If you own a domain name, you can also still set up a Personal Domain, which points your domain to the MobileMe server so your files live on MobileMe but the site’s URL is your own, a feature introduced in the previous version. iWeb ’09 also makes updating your published site more intuitive with the File menu’s new Publish Site Changes command. Just like you click on an iPod icon in iTunes to see its settings, you can click on a site’s name in iWeb to set up its publishing specifications (the icon reflects your choice). The interface is clean and fairly clear. Unfortunately, although you can have different FTP or folder settings for each site, a single user cannot upload multiple sites to different MobileMe accounts. It’s necessary to change your MobileMe settings in System Preferences to change the upload destination, and that changes it for all MobileMe sites. If you are sending your site to your own domain, whether by FTP, the Personal Domain feature, or export to folder, you won’t love iWeb’s method of publishing the actual site folder instead of just your pages. That’s because the uploaded folder becomes an added part of the URL. The fact that Apple creates an index page redirect doesn’t help. There is a shortcoming when using the Personal Domain feature with MobileMe to publish more than one site. (You are actually publishing to MobileMe, but your own domain is used as the URL.) For one site, this works perfectly. But add a second site, and only the first one in your sidebar can be automatically reached via iWeb’s visit function. To get to the second site you’ll need to enter the domain name plus a backslash and then the site’s name. iWeb can now automatically announce your site’s updates to your Facebook Wall, complete with a link to your site. You enable this feature in the site publishing settings window by checking the option, providing your Facebook login information, and approving iWeb's access to your account. 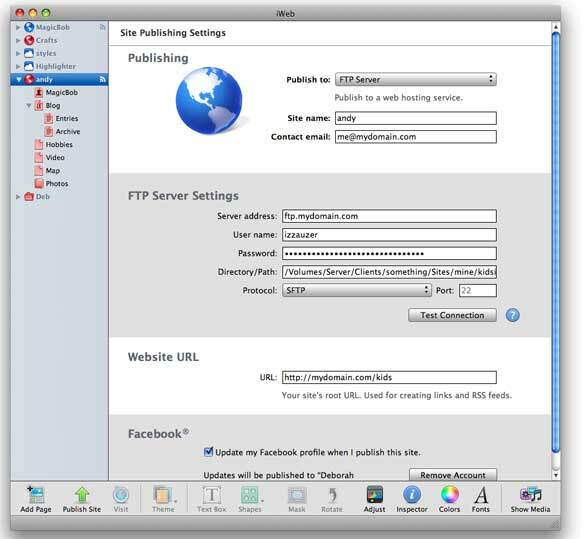 iWeb '09's publishing setup gives you a choice of publishing to MobileMe or via FTP to your own Web host. There are still some advantages to using MobileMe to host your site. Because Comments are stored on your iDisk, blog and photo comments can only be enabled if you upload to MobileMe, not when your site is hosted elsewhere. Many users will be delighted to discover that there’s no longer any difference in the slideshows between the FTP uploaded and the MobileMe sites. Apple’s iWeb is designed for personal Web sites and works very well for this purpose. If you need to build a site for a business or professional use, you may want to opt for something with more broad-ranging capabilities—and you’ll need to host your site on a commercial server (Apple's MobileMe [ ] is strictly for non-commercial use). Despite that, iWeb is not out of the question for business use. Rage Software has some tools and tips to assist businesses that want to build iWeb sites. iWeb ’09 is an excellent program for anyone wanting a personal Web site to share stories, photos, home movies, videos, podcasts, and blogs. Its improved uploading capabilities, easy-to-use widgets, and more straightforward interface will be worth the price of the upgrade. Using the program for professional purposes remains more of a challenge. It’s not designed for professionals, but it can be a great way to start your Web presence.